Whether your character’s in the market for an exotic weapon, a new pet, or an unusual alchemical item to help in exploring old tombs, this book has it covered. Adventurer’s Armory is the go-to sourcebook for supplementing your character’s gear; all of the items are nonmagical and most of them are priced low enough that even 1st-level heroes can afford them! Skill aids and class-specific items! New poisons and black-market goods! Travelers’ comforts, such as cooking supplies and tents! Adventurer favorites, like bladed boots and spring-loaded wrist sheaths! New uses, rules, and tricks for mundane gear! Divine items that react to channeled energy! An alchemist cohort to keep you supplied in the field! This player-friendly Pathfinder Companion works best with the Pathfinder Roleplaying Game Core Rulebook or the 3.5 version of the world’s oldest fantasy roleplaying game. Although suitable for play in any fantasy world, it is optimized for the Pathfinder Chronicles campaign setting. 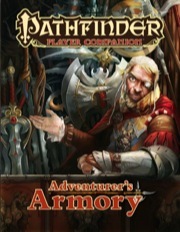 Each bimonthly 32-page Pathfinder Companion contains several player-focused articles exploring the volume’s theme as well as short articles with innovative new rules for social, magic, religious, and combat-focused characters, as well as a persona section detailing helpful NPCs and traits to better anchor the player to the campaign. Errata for the first printing of the Adventurer's Armory is available as a free download (3.4 MB zip/PDF). This book wastes not time getting to the armory of new choices. Basics: This is not a fluff book. Page after page of new weapons and equipment. Also has some equipment for casters at the end as well. Mechanics: A plethora of new weapons and equipment should prove useful for everyone in some aspect. Alchemical Power Components add a new layer to casting by adding effects while also having a useful item in hand. Theme: It is an armory but a specific theme is absent. However there is enough variety to find themes within the book. Specifically the Syringe Spear is one I am fond of for an alchemist. Execution: It forgoes fluff to dive straight into the item descriptions and stat blocks. For this type of book it works. Summary: A supplement of items and interactions. A simple yet useful addition to a collection. Adventurer's Armory was a product completely different than anything that had appeared in Pathfinder's Player Companion line up to that point. Whereas previous entries in the series has been about specific regions or races and contained far more "fluff" than "crunch", the Adventurer's Armory was almost *all* crunch. Full of new equipment, weapons, services, and more, the book drastically expanded the amount of stuff that PCs could spend their hard-earned (or stolen) gold on. It's probably the reason it's the most popular Player's Companion, and (I think) the only one to ever receive a second printing. Indeed, its continuing popularity is such that it's led to an announced Adventurer's Armory 2 later in 2017, which means Adventurer's Armory is the first product in the line to receive a direct sequel. The inside front- and back- covers are tables providing statistics for the new weapons introduced in the book. The interior is then divided into six sections. The first section, and by far the longest at 20 pages, is "Weapons, Armor, and Adventuring Gear." This section is exactly what it sounds like. There are 45(!) new weapons, including some classics from previous editions of D&D like the bardiche and lasso, as well as many I've never seen before, like the meteor hammer, groaning bullets, and syringe spear. One new shield (a "madu") and one new armor (parade armor) are introduced. The section then details dozens of new pieces of miscellaneous adventuring gear, including some that have become extremely common in groups I've played in, such as masterwork backpacks and skeleton keys. Players interested in alchemy will be happy, as a couple of dozen of substances are introduced, including everything from sneezing powder to bladeguard (for rust monster protection!). There are then 24 new tool and skill kits, such as portable alchemist's labs, a stretcher, and a portable altar. Some fun new clothing options are introduced such as tear-away clothing, as well as some eminently sensible choices like hot weather outfits. Foods and drinks receive descriptions and prices: everything from coffee and tea to Linnorm mead and Mwangi coffee. Want an animal as a pet or companion? Dogs, dire rats, stirges (! ), and more are priced. Last, there's a handful of entertainment items (like loaded dice and marked cards) and herbal items. Perhaps disturbingly, there's even an entry on purchasing different types of slaves. The second section, "Combat", comes in at two pages and introduces the concept of equipment tricks. Basically, by taking the Equipment Trick feat, a character can learn to do special things with one particular type of equipment like a rope or a shield. This section details Heavy Blade Scabbard tricks (like flipping a disarmed weapon into an empty scabbard) and Shield tricks (like throwing your shield to bounce off stuff like Captain America). I've never used equipment tricks in a game, but some of them actually look pretty fun. A two-page "Faith" section introduces several new items for divine casters, most of them relating to a cleric's ability to channel energy. The "Magic" section, also two pages long, focuses on the concept of Alchemical Power Components: basically, using an alchemical item as an added component when casting a spell to boost its power. Using a flask of alchemist's fire when casting burning hands, for example, means that one target that fails its save catches on fire. Some of the boosts are quite minor, while others could be extremely useful in the right circumstances, like using a tanglefoot back to allow your black tentacles to reroll grapple checks. The "Persona" section details an NPC alchemist-for-hire named Arayam Bismut. Bismut is given an intriguing backstory involving a family curse and could make a decent cohort. A major thing to keep in mind, however, is that this product came out (I assume) before the Alchemist class became part of the game, so Bismut is statted out as simply a Level 6 Expert. The final section, oddly labelled "Social", introduces the concept of Equipment Traits: things like having an heirloom weapon or being more skilled than most at using improvised weapons. Two new feats (Sly Draw and Splash Weapon Mastery) aid rogues who want to feint and bomb-hurlers respectively. It's hard to imagine a player flipping through this book and *not* finding something useful for their character. The options provided expand, quite usefully, the understandably limited selection in the Core Rulebook. On the other hand, as everything apart from the NPC is open content, these items could just as easily be found in the PRD or PFSRD. Still, I'm confident the upcoming sequel to this book will also sell like hotcakes. Note: The first printing of this book was apparently full of errors and typos. This review is based on the second printing. Although you might think the small size of this book limits its focus, I believe that it is chock full of useful gaming facts. My players use it all the time. The only thing keeping it to just three stars is the total length - I wish it had been bigger. Highly recommended. Sweet, I know what I'm getting for my 39th birthday!!! Yeah i always wanted to see a book like rolemasters ...and a 10ft pole, done by someone. Maybe if this does well paizo will considering doing a big book of mundane stuff. I'll buy this only if it has an 11-foot-pole! Haha! Our poles go to eleven! How about a masterwork 10-foot pole that you can enchant to +1? So magic makes it longer? You're sitting on a goldmine there. Any other cool items you can use to hook us? How about the Scroll Organizer? Fifteen scrolls in a bandelier that can be removed as a free action? Already a magic item similar to that in Magic of Eberron, the Infinite Scrollcase. Holds up to 50 scrolls, and if you have a BAB of +1 or more you can draw forth a scroll as part of a move action. Also gives a +4 competence bonus to cast defensively. Don't have access to that book so I went with what I did know of. This has the feel of the book: Aurora's Whole Realms Catalog. I don't know how I missed this announcement among all the other ones, but this book sounds like it is going to get tons of use at our group's table. The Forgotten Realms Campaign Setting book for 3.0 had scroll organizers and potion belts in it so that you could draw said items for free, especially handy for those times that you need a scroll or a potion to save an ally this round with said item and you have to move to them and use your standard action to perform the saving. I don't like making such items magic items, as it seems to be that a cleverly built piece of equipment should be able to do the job. Obviously the equipment from the FRCS can't be used, since its not OGL, but given that swift actions didn't exist back then, it doesn't seem like it would be too hard to come up with an item that lets you assign X number of scrolls or potions that can be drawn as a swift action for emergency situations. Of course, that's why you have the invention of a certain helmet that allows the wearer to drink potions without a problem. In my campaign, I allow each player to have two quickdraw slots where they can put small items like potions, scrolls, wands, gems, etc. They can draw the item from that slot as part of their action to use the item. It forces them to think about which items they want to be able to access quickly. Funny you should mention that... that's what Lisa had in mind when she pitched the idea. It'll be a little more Companiony than that, though. This was Lisa's idea? Lisa, have we told you you're the best-iest CEO EVAR?!? So you didn't just put it on the table and say "we should do something like that"? You just let things take their course? Very devious. I like it! If you worked at Paizo, you would know that I very rarely ever play the "CEO" card. I make suggestions, and if the rest of the editorial team likes them, then they get picked up. If not, then there is usually a really good reason why not. We almost always make decisions on products as a group consensus effort, which I think makes for a better product list and a more enthused editorial group. This is the best news I've heard today; my copy of Aurora's will enjoy the company on my bookshelf. 'Twill be a grand birthday present when it shows up in my mailbox!! "Bringing Big D**n Justice to the Bad Guys Since 1369 DR"
THIS I believe is why I like Paizo. When they were at Origins a few years ago, with the rough adventure paths Lisa made an off hand comment about wanting to write up something and see if it would be published in an AP. I know you're not playing big boss, but instead of showing them the book and telling them "you think we can use this", you just showed it. I guess you did it very subtly, like pretend it fell into your bag and then left it lying there because "you needed the bag space for your home journey" or something. Mess with everybody's heads to make them do your bidding without them ever realising it. As I said: Devious. I like it. I really like the bag space part. Pure genious on your part! Everybody should have a boss like that. But I guess it works only for a small company with hand-picked staff. Well, we're a bigger company owned by a really big company, and my department head is a pretty good one, too. Mmm... wanting this more and more. Awesome. I remember the Aurora's thing, and I still use my Arms and Equipment Guide. I'm pretty much a sucker for giving my PCs various little pieces of equipment. I still have mine; it's one of the books we are still using in *every* session (just like 'Faiths & Avatars', and, now, 'Gods and Magic'). My only complaint about this book is that I wouldn't have minded having this as a bigger book, i.e. a hardcover with 200+ pages. Lisa, if there is a demand, is it possible to reconsider publishing this as a "real" supplement to PF RPG? Or, alternatively, would you guys consider putting out several volumes of Adventurers' Armory down the years? This sounds excellent! But I must ask if it's written as a supplement to the Golarion campaign world or if it's campaign neutral like the PFRPG Core Rulebook? It's part of the companion series which means Golarion flavoured. I don't think it will take much effort to 'file off the serial numbers' as it were. There will be many items that come from Golarion (bladed scarves, various drugs, and so on), but there will be many, many things that are worldless: many many real-world weapons, alchemical items, skill items, food and drink, entertainment items, animals, clothing, plus the familiar Combat, Faith, and similar articles. Even if you don't play in Golarion, this book should be very useful to you--our goal was players shouldn't have to look in a dozen different books for a comprehensive listing of adventuring gear; this plus the Core Rulebook should be all you need (though we're deliberately excluding firearms and Tien weapons/armor, as those could fill a book on their own). I'd like to see a functional whip like the whip-dagger appear in this book. This is influenced by Aurora's? OK, this looks like a companion book I will buy. Unless it comes in catalog format, on pulp paper with witty stories about the paladin stealing all the orcs socks because they were Aurora's, then no, we will never have a replacement.